We have a duty of care to set people up for a future that won’t look like it does now. Sam: Welcome to Sustainable Lens, Resilience on Radio, a weekly show on sustainability topics brought to you by Otago Polytechnic. This show is co-hosted by Shane Gallagher, who’s not here tonight that’s why I’m driving and me, Samuel Mann. Each week we talk with someone who’s making a positive difference in applying their skills to a positive future. In our conversations, we try to find out what motivates them and what it means to see the world through a sustainable perspective, through their sustainable lens. 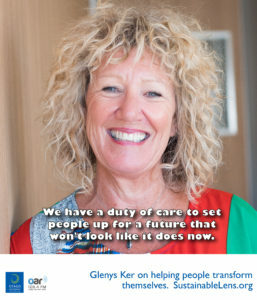 Tonight’s sustainable lens is that of Glenys Ker who is a colleague of mine. She variously describes herself as a career practitioner, educator and she has got more degrees than anybody. I think it’s seven and she is almost at the point of having a doctorate of Professional Studies because it’s getting submitted in the very near future. Welcome. Sam: What was it like growing up in Geraldine? Glenys: It’s the perfect childhood, small town, everybody knew each other, everybody did everything together so lots of sports, church, guides. Yeah, great growing up. Sam: What were your parents doing in Geraldine? Glenys: My dad was self-employed. He was a milk vendor. My mum was a nurse, palliative care nurse. Sam: Early teenage, getting past the astronaut and the train driver. Glenys: The dancer and the fairy. I probably wanted to be a nurse, but my mum was a nurse so at the teenage years, you don’t do what your mother is so, I decided I’d be a teacher. Sam: What did you think that being a teacher would let you achieve? Glenys: One of the first things I liked about teaching was all those holidays, but I had some really good role models as teachers at Geraldine High School and I loved the way they influenced young people so, I think primarily, it was if I could influence people that appealed to me. Sam: You went off to Teachers College? Glenys: I did a one-year course at then community college, Timaru, South Canterbury Community College in Secretarial Studies so accounting, business management type stuff. Did a stint in those days, work experience as a legal secretary and while I loved that life, I didn’t like the role of the secretary. While I was there at polytech, the teacher was sick and I said, “I’ll take the class.” Unbeknown to me, the people from teacher training college were there and that is really how I got into teaching because they thought I was the teacher. I went off and did … What was it called in those days? Commerce, I guess. Yeah, so I went off to training college. It was a bit of luck really. Sam: Did the teaching education deliver on what you hoped it would? Glenys: Yeah, it did. Those are early years, late ’70s, and they let you experience teaching. You got to play and the lecturers were … You might even know one of them, Burt McConnell. He was my history teacher at Geraldine and then, he ended up at training college and so it was kind of neat, but it was that sort of playground of figuring out how to tune kids onto learning, which I loved. The subject area was totally irrelevant. Economics and accounting, that’s the most boring topics, but also at training college, you could take off and do other things….that kind of thing appealed to me. Sam: Did you find yourself teaching? Glenys: Yeah, oh, yeah. I’ve been teaching ever since in some form or other. Yeah, initially, secondary and then, back to the polytech that I first studied in so Timaru, Aoraki and then AUT, and then to Otago Polytech, so all sectors of tertiary, yeah. Sam: What led you from high school to tertiary? Glenys: I came home because one of my parents was sick and I was teaching at two schools in Timaru. I went back to Geraldine to look after my mother and someone found out I was there and said, “Oh, you want to come to the polytech and teach?” Ten years ago, I was a student.” That’s how it started and I loved adult teaching. People tended to come to polytech because they wanted to whereas secondary school, kids went to school because they had to. There was quite a shift so that was exciting really. Sam: How did you get from there to careers practising education? Glenys: Yeah, that’s another story. I taught at Aoraki. I tended to teach certificates and diplomas and office systems, business type programmes and a lot of outreach programmes. I’d be putting typewriters in my car and roaring off to [inaudible 00:05:54] and teaching in the tennis pavilion, and I loved that kind of life. Then, how did I get from there to where? Glenys: Careers. Then I went to Auckland and decided to have a break from teaching and bought a café in the heart of Auckland. Then I taught unskilled people to work in cafés, but my heart was in teaching and AUT had a job, a part-time job going in student services so, I went into the learning centre and helped people learn, who needed extra support. Then, the director of student services at the time set up a career centre and I ended up temping in there. Then, one day I thought, “I can do this.” At the same time, they created the grad dep and career development, more grad [inaudible 00:06:49] so, I thought I’ll study that. I thought teaching career development, there’s some similarities and there’s some differences. That’s how … I fell into that, too, but again, if you look at the thing, helping people figure out what they want to do and be helping them learn. There is a theme there. Sam: Where do you think that theme came from initially? Glenys: It’s really interesting. It’s not ’til you’ve grown up that you actually accept that you are your parents’ daughter. My father had had other jobs, a traffic officer and a mechanic, and he actually liked working for himself. He was autonomous, independent and ahead of his time and so he picked self-employment. In a way, there’s a theme for me as the independents. The other is my mother was in the field of helping people. Her nursing career took her into social work. Then there was a time where she went and lived in people’s homes and cared for sick people. She was in the hospital system. She was in the hospice system. In a way, that’s all about helping people, isn’t it? I think I’m my parents’ daughter really. Sam: You’ve certainly inherited somehow that entrepreneurial spirit? Glenys: Yeah, very much so. Sam: Not just in businesses, but audacious ideas and going off in different directions. Glenys: Yeah, yeah, I think that’s a way of being, isn’t it, taking risks and saying yes to things rather than confining yourself, yeah. Sam: When you actually eventually sat down to do a Master’s in Career Development, was it stuff that you knew or was that an eyeopener for you? Glenys: The Master’s was amazing and it was an Australian programme and it was like there’s plenty of open scope to what you chose to learn and they took you through almost a generic career development and then, a specialist and then, a very strategic so it fit in my personality. The supervisor of the programme liked the different students and there were two of us who neither saw the world as it was and we ended up lecturing on their master’s programme. I think that, again, that was a lecturer or a teacher that sparked my interest and I saw career not just as a career counsellor helping people in redundancies or getting a job or writing a CV. I saw it much bigger than that. Yes, it did open my mind and lift my thinking to a different level, which meant I can do anything I wanted. Sam: Do you have something resembling a philosophy of learning? Glenys: Depends what you mean when you ask that question. Learning is something that you do and I think with … I don’t know. What is it? [Bastardised 00:10:18] it? In a way, we believe that it’s our job. We’re the experts and we should tell people what they need to think and learn, and I don’t believe that if you go back to early, little kids, they don’t learn by being told what to do. They learn by observing and watching and doing and making mistakes. I think you and I have talked about the child that learns to tie their shoelace. They didn’t go through a lecture to learn that. They didn’t read a book. It’s practice, practice. I think learning, it shouldn’t be confined. It should be fun. People should want to keep learning. I don’t know what it would be like to stop learning. It should be a way of being, rather than something that you sign up for. Sam: Where did that vision and that passion for that vision come from? When you went to teachers’ college, you said it was you were able to experiment? Sam: Did it come from before that? Glenys: It must’ve because if you look at my … As a young child, like 8, 9, I was in charge of the brownies and then, I took girl guides out on tramps and I taught young people how do to do stuff. I think, is it in your DNA? I think I’ve always had that love. I don’t think I learned it at training college. I think training college gave me the opportunity to experiment how you could tune kids on to learning. Sam: In terms of career practice, you say it’s more than teaching people how to do a CV. When does it start? Do we start it too late, too early? Sam: Where do people get these ideas? Glenys: About what they want to do and be and think? Glenys: Usually at primary school. Career development should be then. It’s really native. If you can think back to when you were 4 or 5, you probably wanted to be a fireman or I don’t know, what did you want to do at 5, Sam? Sam: Not sure what I wanted to do at 5. Through high school, I wanted to be a set designer. Glenys: Yeah, yeah. I think those ideas stem from a very young age and they usually stem from role models, don’t they? You watch what someone does and you go, “I wonder what that’s called that they do.” As a young child, I wanted to be a policeman. Policeman? Policewoman. I wanted to help people, but I was too short in those days and I did want to be a nurse. It starts at such an early age and it’s up to parents and all sorts of people to motivate or grow that, I wonder what you could be. I think also the downside is perhaps for young people today is they could be anything if they only knew what it was because it’s information overload. Sam: Do you think that we, not scare that out of people, but almost beat it out of them? Sam: This desire to do something, achieve something, but then we label it and we make them do accounting or economics and things through high school? Sam: All of a sudden, they’re not changing the world. They’re being an accountant. Glenys: Yeah, they’re confined and I think that often, the people that have a part to play in that role, like I always am amused sometimes when kids love history at school so the teacher tells them to be a history teacher. Seriously? Why don’t they brainstorm all of the things a kid could do because of their love of history? Then the traditional kid that’s good at sport, “You need to do phys ed.” We turn them off. We haven’t been creative about what that could. I think that at [Aor 00:14:34] growing up, we had to be something. When I grow up, I’m going to be a doctor, a nurse, a policeman, a fireman, a secretary, whatever. Kids these days, they grow up and we’re teaching them that they have a range of skills, a range of interests and so then, the hard bit is what could that look like? We don’t want to stifle that in young people. I talked with someone today and she said, “I’m just a.” That makes me sad. I said, “I’ve just looked at your CV and I don’t even understand the words you’ve got on it that’s awesome what you do. I have no idea.” She went, “What do you mean you don’t know?” I went, “I don’t understand what you’ve written down. Tell me about that.” Her eyes lit up, but she still was “just a.” That’s very sad. Sam: You and I work for Capable New Zealand. Sam: You can give us the introduction to what it is. Glenys: Capable New Zealand is an innovative school, part of the Polytech that’s probably in the business of helping or supporting or guiding people who already have significant skills and knowledge, significant experiences, and they want to grow and enhance that, change it, open it up, shake it a bit. It’s not for younger people with no experience because they do need to go and learn about stuff. These people come and often, they want their skills and knowledge from experience validated against a qualification and we help them do that. I guess the fun that’s about there that people have horrendously amazing skills and knowledge. They just don’t know that and so, the reflective process that we take them through helps them to really think about actually they know a lot and then, as that confidence grows and that knowledge and awareness happens, they’re open to new thinking, new learning, new ideas. That’s what’s fun about where we work. Sam: That is the subject for your doctorate. Glenys: Yeah, yeah. Yes, it was the subject. Is it was yet? Sam: No, no, no. You have to actually hand it in for it to be was. Glenys: Okay. Yes. I set out to survey over 400 people who had undertaken two qualifications. I picked those two because they are the most popular so the Bachelor of Applied Management and the Bachelor of Social Services. They had gone through an intensely reflective process with us and I wanted to know what they learned, what they thought about, what changed, what they’re doing now as well as what could we do better, that’s always good because 99% of those people had a successful journey, successful learning process and their lives had changed. For me, how neat is it to write about that? Sam: In what way their lives changed? Glenys: They had a new language. They had a set of skills that they actually believe they now had. It gave them the confidence to challenge new jobs or take on new directions or continue learning. A lot of people have gone on to do master’s and I’m sure they’ll be back to do the doctorate, which we’re going to be offering, aren’t we, Sam? Glenys: Almost there, yeah. Confidence, identity, new brands, new language, all those things happen. Sam: In what way is it new learning, in which way is it ticking off the boxes of the stuff they’ve already got? Glenys: Yeah, a lot of people hope that they’re ticking off boxes and that isn’t what it’s about. Often, the first piece of new learning is understanding how to reflect, how to go, “How do I know that? Where did I learn that? : All those questions that you just asked me, I know that because it’s inherent in my upbringing. I can’t lie about where I grew up, but the first job, what did you learn? How did you learn how to take kids tramping at 11 years old? What did you do about risk? People love that because it takes them back to stuff they’ve done and so often, the first bit of new learning is to learn how to reflect. I’m always blown away when people haven’t. Then the next bit of learning is often how to write, write differently, write professionally. Not necessarily academically, but to write coherent sentences that make sense, that sum up information. Some people learn how to research, how to find out more about stuff, to be curious. Some people learn that they actually have a lot of skill and knowledge, that they have an identity so, they no longer say, “I’m just.” There’s lots of learnings. Then people invariably at the end of the learning process, they pull together their skills and knowledge into a framework or a model, a practice and then, you see the old me and the new me, and that’s quite transformational. Sam: Does learning have to be transformational? Glenys: It depends on your belief about what transformation means and usually, transformation is as a result of something that changes and it changes and it has an impact on you for today and the future. I think sometimes, people just don’t understand what transformation means. Even the kid that learnt to tie their shoelace at 5 is transformational, though they probably won’t say that. Sam: How do they learn how to transfer that new learning about themselves or this transformation about themselves to their new self? Glenys: It comes out in many ways because part of the assessment process, they … A lot of it is written reflection so, they do have to do that and they often get evidence to attest to stuff they’ve done, but then they sum up and they orally articulate who they are and what they are and why they are and what their values and beliefs are and what they’ve learned to a panel of assessors, and as they speak out loud, they start to believe more so than writing it down. We see the transformation. We see the new language, the confidence, the identity that’s changed and often, you’ll see it in their CV or even just in the way they talk about themselves. When they say, “This is who I am and what I am and why I am,” they couldn’t say that at the start. Also, the fact that two people who have experience are assessing them so they know it’s kosher. Glenys: The light bulb, yeah. Sam: Yeah. It’s very much a set of attributes, systems thinking, critical thinking, creative thinking. Is that something, do those things come through that reflective process? Glenys: Yeah, yeah and in many ways and in many different ways. So often in social services, you’ll often hear people not only thinking about their own self-care in horrendous jobs. They’re thinking about supporting other people to have safe lives and healthy lives, and also the communities. While you were talking, I was trying to think of all of the things that you come through. Sustainability is also developing skills for the future. It’s quite interesting. They often start out with the light bulbs and the recycling and then, they start to push it out around economic stability, sustainability, social sustainability and it’s neat to see that happen, but it does come out and if it hasn’t, naturally, we talk about that. We bring in people like you to talk about it. Sam: When they’ve gone through the process, do you need to cover each of those things or if you’re going to have a decent conversation with about ethical frameworks, does that go wider to things like sustainability? Glenys: Yeah, yeah, yeah. You got to see it as a holistic process rather than a discrete set of tasks and often, the learner can’t do that at the start. In a way, we’re a connector, a joiner of dots. We help them start integrating stuff. That’s neat to watch, too, because a lot of people do control their life by putting it in boxes. Of course, we know that that isn’t so. It’s the whole self as well and you see that ability by the time they’re finished to combine information and knowledge and thinking. Sam: Do you think it’s an easier process than going to class? Sam: You’re talking about yourself there, not me. Glenys: Yeah. No, sometimes. That’s part of it, but it’s not easier. It’s just more validating when you’re an adult. Yeah, you can’t equate it. Sam: All other things being equal, if you were advising an 18-year-old that was choosing should I go and do this work or should I do this degree, and if I don’t down the work route, I’ll go through a reflective process later, how would you balance that? Glenys: That’s an interesting question because usually, young people don’t make decisions on their own. They’re highly influenced by their family. They want to make their mum and dad proud or their parents have huge influence where they’re expecting them to do that BCom. Then they can do what they life after that or they’re influenced by their peers so everyone’s going to uni to do a BCom so we’ll all do that. I think that’s the sad bit and the hard bit. Some people quite naturally have a disposition to want to go to university or polytech straight away and get stuck into learning new stuff and being part of a class environment and that’s really cool. Some people, like I’ve got quite a few kids that actually needed to work and figure out what it is they actually love and it’s okay. Doesn’t matter when you do your study or learning or how you do it. I think there’s no one size fits all, but the skill of a career practitioner is to challenge the thinking of a young person and that can be hard if mum and dad are in the career session or if their mates are because they’re highly influenced by that. Because study is so expensive, you don’t want to set them up to fail. From my experience, kids that go to uni or polytech, I’m not talking about one specific, go onto higher education and they don’t enjoy it and they fail, then their loss of confidence is far greater than if they go and get a job at the supermarket for a couple of years and learn about management. That’s always of a worry to me. Sam: I described you as a career practitioner, an educator and various other things. You described yourself in one point just then as a connector, a joiner of dots. Sam: Other than doing dot to dot puzzles, how do you describe yourself? Glenys: That’s a hard question because depends who asked me the question as to how I answer, but I’m in the business of transforming people’s lives and whatever that means, whether it’s career counselling or supporting a friend or tuning someone on to learning, I want to help people have a better life. The people that don’t need me, that’s fantastic. Sam: What happens if their idea of a better life is quite clearly wrong? Glenys: Firstly, there’s a whole lot of ethics in that. Sam: I was winding you up for that question. Sam: No, that sounds good anyway. Glenys: Yeah. Yeah. Someone says, “I want to learn to be a burglar and rob people off, old people’s homes at night,” I’m probably going to challenge a whole lot of things around that and try and put them onto something where they can do something less illegal. I don’t want people to do harm or do anything illegal so, I would probably have to say that. When I worked with elite athletes, one of the codes is no drug taking and things, and so you have a duty of care to people to keep them safe and to get them the support, even if they’re not telling you and career practitioners have a code of ethics, too. Equally, I could have someone that comes to me who’s been in gaol for 10 years and actually has decided to have a better life. It’s about not judging that and finding a pathway. Sam: You described it as a facilitation process. Is that a subset of teaching, different to teaching? Glenys: It’s got the same traits. Sam: See, I know the chapters in your thesis. Glenys: I know. Yeah. It is the same as teaching, but it’s teacher centred. Teacher centred? Student centred learning. If you look at the literature around what a good teacher does, they support, guide people. Yes, that’s where it is similar, but I might add, we don’t want to be the experts in other people’s lives. We want to help them be the expert, but sometimes we need to be the expert because they’re not there yet, but it’s how you do that. I like to call it the dance, but you don’t like that, Sam. Sam: If we can presume to advise the rest of education, what could they learn from this reflective learning process? Glenys: Predominantly, teachers are fantastic. I’ve seen some fantastic people in classrooms tuning kids onto learning, using applied methods. I think for 100 really good teachers, there are probably 5 that should’ve left. I actually think by and large, they are doing the right thing. They’re tuning kids on, they’re trying to find ways to motivate them, to help them to learn, but often, that’s also up to the young person. They might be in the wrong class or they just might need to grow up a bit. Sam: You said you never see the world as it is. Sam: What do you see? Glenys: As it could be. What’s the Kennedy quote? “Some people see things and say why. Yeah, I see things and say why not.” It’s the last glass half-full mentality. I always tell the story to my students that I sat on a bus one day to the airport when I was young, 19, and I engaged in a conversation with a much older man because I’m a chatty person. In those days, you don’t have cell phones or iPads. When I got off the bus, he offered me a job in a very important company in those days and that’s how it should be. I could’ve said yes, but I was on a pathway where it was exciting and I didn’t need that opportunity, but it’s about looking for opportunities and saying yes to stuff, developing that resilience. There’s been very few times in my life that I’ve said no to stuff. As a self-employed person, people would say would you take this job on? I said yes to everything. Probably not very sustainable in terms of work life balance, but that’s how I learned. Sam: In terms of not seeing the world as it is and in terms of transforming people’s lives, mostly, you’re talking there about individuals. Do the same things apply if we scale it up? Can you do this for societal level problems? Glenys: Putting people into groups, into cohorts and working together. Is that what you mean? Sam: No, I’m thinking about solving world hunger, sustainability. Sam: Can we apply these sorts of principles and ideas at a much larger scale? Sam: How do we go about doing that? Glenys: Give me an example. Someone comes in to see you and says, “I want to solve the world, I want to save the world, I want to solve world hunger.” What would you say? Sam: The solution will appear. Sam: I think it’s as you go round and round, you get better at understanding what’s happening. Glenys: It is very cyclical and that’s very … I’m just trying to understand that question though because often young people don’t know what they want to do and don’t know what they want to be, but they have a fundamental wish to make the world a better place. I’d be interested to see what that could look like and how we build young people to develop skills to do that because that’s a big bold goal, isn’t it? Sam: Yeah. Do you think that, where are we on the numbers if you like? If we put make the world a better place on the other end of a continuum, maybe we can’t do this, but I’m going to do it anyway, to I want to drive a big car and earn lots of money? Glenys: You do get that. The people will often take engineering or plumbing, that’s the latest, because it’s the biggest earner at the moment. The fact that they don’t enjoy it and have no passion for it is totally irrelevant. They can apply themselves to learn that skill and then, they can earn big money. Sam: Is it as obvious as a gender separation on that? Glenys: No, I don’t think so anymore. There’s plenty of young women that have the same attitude. Those people need to go into social service types jobs, the helping professions. Sam: Do we have a duty of care? You talked about that duty of care that we have for our individuals. What do you think that we as educators, what’s our duty of care on a much bigger perspective? What are we trying to achieve as a whole? Glenys: I think the word sustainability comes into play here again. What is the future? What does it look like? How do we help people have sustainable futures? What does that look like? Because I think there’s a lot of people that don’t even think about that. We have a duty of care to set people up for a future that won’t look like it does now. There won’t be jobs for life. There won’t be the jobs that we currently have. There’ll be roadblocks doing that. I think some people don’t really appreciate that. We do have a duty of care. Sam: If someone comes in and says they want to be a, whatever it is that we are pretty sure isn’t going to survive much longer, do we plan to talk them out of it? How do we manage that? Glenys: I don’t know that you talk them out of it, but you challenge the thinking. It’s the kid that says, “I want to be a doctor.” “Tell me why you want to be a doctor. What is it that a doctor does that appeals to you?” Because often, they have no idea. We have a duty of care to broaden people’s minds and perspectives. Glenys: Yeah, will isn’t life, the paradox? Also, that helps people develop resilience. You don’t want them to want to only be nurtured. The skill of a facilitator is knowing when to be what. If they’re having a vulnerable moment, you’re not going to push them at that moment. You are going to be kind and caring, but then you’re going to slowly push them, keep them moving. Sam: Do you think your understanding of paradoxes, is that a fundamental thing that’s missing from our whole education? We’re too good at teaching people black and white or that’s what we tend to do, and it’s actually the subtleties that matter? Glenys: Yeah. Yeah, yeah. Yeah, and I think … but I start to see a lot of people using a lot more case studies, real life issues these days where they are exposed to that. When you’re 18 and you’re trying to fill someone’s little brain up with a whole lot of knowledge and information, that’s quite an interesting concept, isn’t it? There needs to be a lot more applied practical exercises, really scary ones. Sam: You’re talking about there won’t be jobs for life. What is the future of work? Glenys: The future of work, certainly no job for life and for people to be really adaptable, flexible, mobile. What’s really interesting is facilitators work differently. We seldom work with learners between 9 and 5 because our learners are at work. They’re online with us at 8:00 at night when their kids are in bed or they’ve got an hour or Saturday morning. We work differently and so that flexibility, that ability to go, “Oh, I’ve got nothing on this afternoon. I might go to the gym and get the groceries and go and visit a couple of people because tonight I’ll be working,” it’s a total mind shift. It wouldn’t matter if there wasn’t anyone in the office, Sam, because they’ll all be working differently. Also, that whole self-employment thing, you’re only as good as your last contract. People have to understand what that means. There’s no expectation of an employer funding your lifestyle that you think you deserve. Those kind of things are gone. Sam: We have this idea in education that we’d like to be doing things…something about lifelong learning. Glenys: I like to think so. If you tune people onto learning and motivate and enthuse and inspire people and find the things that do spark their interest, then surely that … Lifelong learning doesn’t mean doing what I did and doing a whole range of qualifications. Learning doesn’t have to be attached to anything. What did you learn today? Can you tell me five new things you learned? Sam: I could, it might take a while to think through them. Yes, I think I could. Glenys: Yeah, so just tell me one thing that you learned that was new for you today. Sam: I’ve been in assessments all day so, I need to be careful about what I’m talking about with the individuals, but there’s some ways that people have matched their professional framework to what they’re doing, which has actually been quite interesting things, and the different models that people are using for doing that was really interesting today, and that the difficulties of applying standard research methods to this kind of stuff, but they’re recognising that the work that people are doing particularly at the master’s level, we can’t simplify. It’s not we can’t do the research by reducing everything down to a single factor and just testing that. It’s people are in their messy work and that the participants in their research are their boss and their colleagues and the people they’re managing and their customers, and we need to pull all that together so there is really different things about what we’re doing. I had some insights about that today. Glenys: Yeah, that’s why the literature on work-based learning is exciting because it explains that. That will be hard for some people to transfer their thinking from traditional research and academia to professional practice. I think that’s a leap, isn’t it? Because you don’t have to attach your thinking to 50 other theorists that said something. Sam: The challenge as work is changing, but particularly at the master’s level, but also to some extent at the undergrad is that people are describing jobs that, they’re doing them, but don’t exist as a recognised discipline despite the fact that they’re doing that work. They’re defining their own framework of practice. Glenys: Yeah, and also you will be hearing cross-disciplinary approaches. Traditionally, people studied subjects like business, social services, accounting, nursing. What about the people and work where they don’t … Like today, I had a good example, a lot of people didn’t line up to anything. Our professional practice qualifications are perfect because it’s about their professional practice, which is multidisciplinary. It’s management. It’s economics. It’s accounting. It’s business improvement. It doesn’t fit into something. It’s melded together. Then all of a sudden, there’s a new project so they’re off doing quantity and quality control. I also don’t think people understand how resilient they are where they, “Go, yeah, it’s new. It’s all part of the job,” and yet they’re still working in the same organisation, but they’re doing complex work. That’s another thing. People aren’t going to be subject specific. They’re going to be very integrated. I think our professional practice qualifications are a way bit ahead of its time for some people because they keep thinking, “Oh, is that management then or what fits under there?” That’s neat when they get to that point. We just need an undergrad there. Sam: Some questions to end with. What’s your go-to definition of sustainability? Glenys: Yeah, well, that’s one on the spot. I don’t have one. I’d have to think about that. Glenys: What would I say to them? Why shouldn’t you care? Usually people come from communities that they do care about … they care about the land. They care about the people. Then you find that when you say, “Oh, well, so in 10 years’ time when there’s no fresh water,” they start to think about it and they do start to make changes. Yeah, different communities see it quite differently, but people don’t say that to me, Sam, “Why should I care?” Even young people don’t say that anymore. I think young people have got a much bigger sense of social responsibility. I think that era is past, of leaving the tap running while you clean your teeth. Sam: What is the biggest success you’ve had in the last couple of years? Glenys: My passion, transforming lives, I know that, but my passion is the second chance learners. I love the people that university or higher ed or polytech wasn’t for their family. It wasn’t for them and so, they left school at 15 and got a job. Then a lot of the athletes I work with that hit rugby or cricket at a young age and sport was their identity and sometimes English is a second or third language, I love those. I love helping them make a difference. I think that’s where if I had a choice, it’s where I’d stay. I’ll leave the masses for you, Sam, but I’ll do the review of learning and the things in your life. It’s helping people who didn’t think that this was for them, being the first in the family. Sam: We’re writing a book of these interviews. We’re calling it Tomorrow’s Heroes. What is the super power that you’re bringing to the team? Not the one you wish for, the one you have. Glenys: Maybe you have to tell me. I don’t know. Sam: You see, the thing about these super powers is that they’re not magical. That’s the point. They are things that everybody could have. Glenys: Super powers? I don’t know. A super power? Sam: I’m going to put words in your mouth here. Is it a belief that you can make a difference for other people, with other people? Glenys: I don’t have an ego that it’s about me. It’s never about me. My motivation is when you see their families at graduation and you see them cross the stage. For me, I don’t need to be important in that process. I need to make that clear, even though it’s cool when they go, “Thanks, Glenys. I really hated you.” It’s more that I’ve tuned them on to something they never thought was for them and tuning people onto learning is important to me, however that learning is. I’m not necessarily qualification focused, but for some people, they do want a qualification. Our oldest learner is 86. He wants to graduate with his great grandson. How awesome is that? Glenys: God, what is the definition of an activist? Sam: You get to define it in your answer. Glenys: Someone who sets out to make a difference, someone who sets out to change the world. Sam: If we go for that, are you one of those? Glenys: Yeah. Yeah. Come on, super powers and activist. I don’t use those words, Sam. Sam: What motivates you? You said families at graduation, but that can’t get you out of bed every day. Glenys: It does actually. Helping people does get me out of bed all day. Making a difference, watching that spark of interest and sometimes, it takes five or six months to see it, but I always like looking for the glue. I don’t care … You know how people tell you a story. I don’t always listen for the facts. I listen for the bits they don’t see. I listen for the glue and then, I come back to it. People talk about that and I often don’t know how I know, but I find it, all the gold. That’s fun. I can dine out on that for hours if I’ve found that for someone. Sam: Not trying to be an expert on their lives, but perhaps some sort of magic mirror. Glenys: Yeah. Sometimes you are the expert for a while because you can see they’re struggling so you are guiding them and giving them more help and information for a while and it’s knowing when to let that go. It’s just not that whole traditional I’m the expert and you’ll listen to me for two hours while I talk at you. Sam: We’ve got a minute to get to three questions. Biggest challenge you’re looking forward to in the next year? Glenys: Actually, it’s crossing the stage with that red gown. It’s never been about the graduation, but somehow I think it will be. Glenys: That everybody could afford to learn, to study, to get those qualifications, to make a difference, that education was free. Glenys: If you are one of those people out there that have significant skills and knowledge from experience and would like to see if that matches something, I’d love to talk to you. Sam: That sounds fantastic. Thank you very much.